Terrific Icons Bobble Head based on the The Twilight Zone TV series! Comic-Con Exclusive from Bif Bang Pow! Features 3 floating, bobbling objects! Authentic black-and-white color scheme, in excellent, series-true detail. Entertainment Earth Comic-Con 2011 Exclusive! Standing about 5-inches tall x 4-inches wide and fashioned of resin, this terrific Icons Bobble Head from Bif Bang Pow! features excellent detail that's true to the legendary The Twilight Zone TV series and typical of the bobble heads in this line. 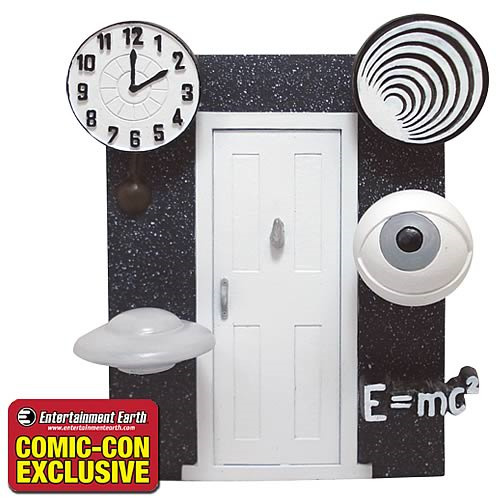 In black and white, it includes 5 unforgettable symbols synonymous with Rod Serling and The Twilight Zone: clock, swirl, eyeball, spaceship, and E=mc2… and 3 of them float and bobble! No Twilight Zone collection is complete without the Icons Bobble Head!